We were so close. The timing was almost perfect. Sure, it could end horribly, with double toddler tantrum a cappella until it was over, but that line of thinking would imply that any new experience with the Twins has such potential. Pessimistically speaking, the whole trip was a risk, but we’d gotten this far without a hitch, and now, in The Happiest Place on Earth, the optimism was running high. And there was just no way we were going to leave Disneyland without going on The Pirates of the Caribbean. You see, to us, this wasn’t just a ride. It was a pilgrimage of sorts, a half-decade in the making. One the earliest conversations my wife and I had when we first started dating in January 2007 involved divulging each of our Favorite Things Ever–you know, one of those late-night heart-to-heart sessions common to the super-duper thrill of a new relationship. I had learned early on about her incredible sense of smell–we’re talking vampire-caliber here (to this day she can literally detect a poop-filled diaper from the opposite side of the house). With that in mind, I eventually wound up asking her what her Absolute Favorite Smell was. I’d intended that day to be sooner, but here we finally were, five years later, standing in front of it with our kids, and my wife was suddenly reluctant to ride it. I examined her face as every few seconds it wavered between reluctance and enthusiasm. She had to be kidding. There was no way I was going to let her miss out on this because the Twins MIGHT not like it. Besides, we’d already been on Pinnochio, Dumbo, and Winnie the Pooh, and they’d ooh-ed and ah-ed their way through each despite the occasional “scary” parts Disney sadistically insists on including on rides for their tiniest patrons. I looked down at our little troopers, still fast asleep in their strollers, so comatose that they hadn’t even shifted positions. My son woke up as my wife jostled him out of the stroller, but my daughter was still out cold, and stayed that way for the entire wait in line, her face buried in my chest. “Should I wake her up?” I thought aloud as we boarded the boat. I weighed my options. I could wake her then, before she was ready, and face almost certain fussiness (a less-than-ideal demeanor for trying new things), but avoid the ride startling her awake. On the other hand, I could wait it out and see if she was tired enough to sleep through the whole thing, and if the “Yo-Ho’s” happened to wake her up, I’d play it by ear. I noticed my wife take a deep sniff and crack a smile as the vessel pushed off. My son sat furrow-browed in her lap, as he had on nearly every ride that day. At first we weren’t sure if he was having any fun, but the moment we took him off each ride, he’d assert his utter discontent. I later learned from my mother that I did the exact same thing at his age–soaking up novel experiences like a sponge while simultaneously analyzing the hell out of them. But this time, as we crept into the concrete caverns with pirate threats reverberating around us, he shifted uneasily despite my wife’s efforts to calm him. Meanwhile, our little girl was still dead to the world, which, according to the voices around us, meant she would not be able to tell any tales. As we approached the pirate-headed mist, I noticed the boat ahead of us plunging downward, its passengers squealing excitedly. Here came the drop. I’ll admit that for a second, I thought I could somehow pull off keeping my daughter asleep. I planted my feet in the bottom of the boat, pressing my back against the seat, and took firm hold of her to dampen any turbulence. Despite my son’s obvious disapproval and the fact that my daughter was probably moments from a meltdown, I still felt that familiar old tinge of anticipation as our vessel meandered into blackness. Had anyone in the boat been wearing night-vision goggles, they would have seen a grown man with a big, stupid grin on his face, awkwardly bracing himself while cradling a sleeping toddler. I don’t know whether it was the sudden dive, the cool water drenching her shirt, the collective “woo” of our crew or some combination, but in the middle of the drop, my daughter jolted awake. There was no crying–there was just looking, in a toddler sort of WTF fashion. Is this a dream? Where are we? Why am I wet? What’s with the singing? “It’s okay, baby girl,” I reassured her. Okay, Daddy’s here. Is Mommy here? Okay, sweet. Mommy’s here, too. What about Piglet (her go-to stuffed animal)? Check. And my thumb? All right! Fantastic. Let’s get that in my mouth…and…we’re good. Surveying our surroundings, it occurred to me that there were skeletons everywhere, and looking at it through the Twins’ eyes, I suddenly felt uneasy myself. For a kid who’s never seen anything like this before, this could easily inspire not only heebies, but also jeebies. My son’s shivering continued, and about halfway through seeing the actual Pirates of the Caribbean, my daughter decided that Daddy, Piglet, and the thumb just wouldn’t cut it, so she crawled her way into Mommy’s lap next to her brother, where they both stayed for the remainder of the ride. 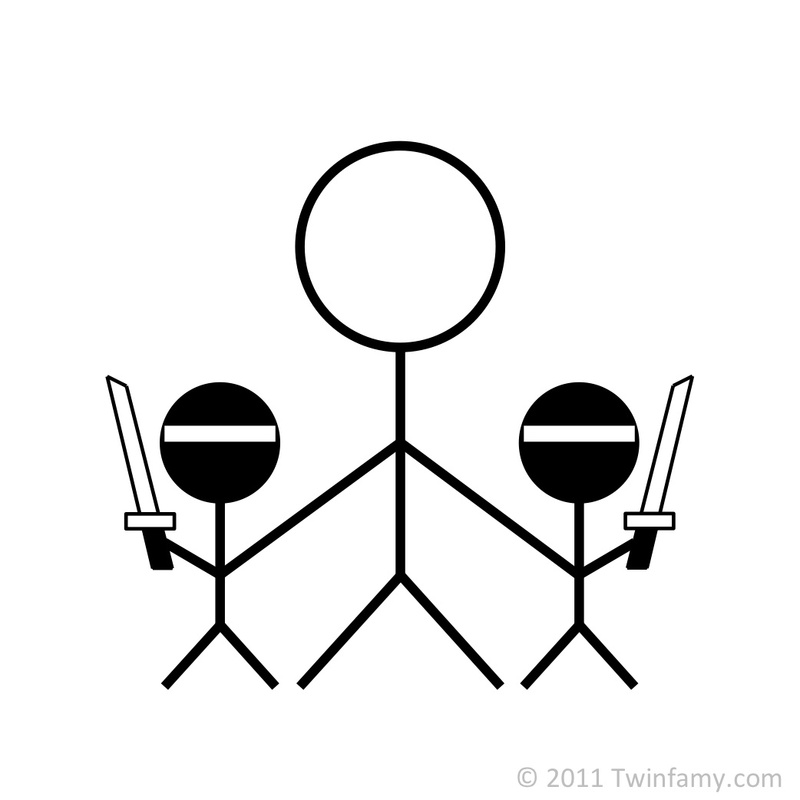 In the end, I was proud of the Twins for sticking it out without completely freaking. While I was a little offended that I was not the go-to parent in the face of fear, it really gave my wife a jolt knowing that although I’m the one with them more often than anyone, there’s just no substitute for Mommy, and I’m completely okay with that. And it definitely gave her an incredibly memorable experience–a mish-mash of her youthful, carefree memories and the life she now has as a mother (and I guess also sharing her favorite ride/smell with yours truly). Some may argue that bringing 19-month-olds on the Pirates of the Caribbean is a little much, and you’re entitled to your opinion, but at the same time, I don’t know that completely sheltering kids from anything remotely scary is the best approach either. How will they learn to cope with being afraid if it never happens? Then again, these are also the same people who killed off Bambi’s mother, devastating generation after generation of audiences who just want to see cute animals ice-skate. Never mind. I was right the first time. 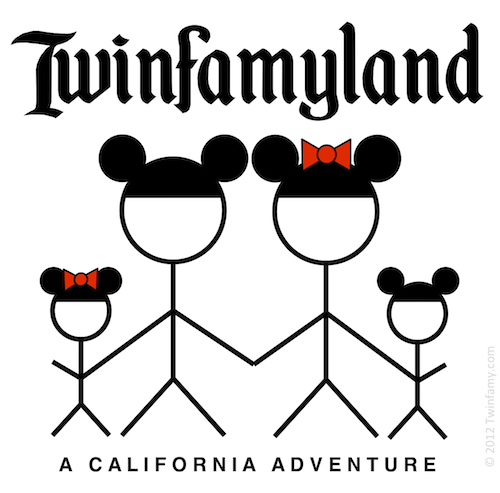 This is the second installment of Twinfamyland: A California Adventure, a thrilling saga of Twincidents committed in Southern California. If not, I’m not a dead man yet, and have plenty of other tales. Awesome! You totally did the right thing, in my opinion. I’m only saying that because they didn’t freak, of course. If they had lost it, then I’d have to berate you. Especially if I was one of the people riding along with you. Did you see this story: http://www.knuj.net/2012/09/parents-on-flight-give-everyone-on-plane-a-gift-bag-for-tolerating-their-babies/? I took Li’l D on it very early on. He enjoyed it the first time, when he wasn’t totally perplexed what the @#% was happening. The second time, he was a little nervous. All the subsequent times, he’s more or less been fine . . . until yesterday, when we got near the head of the line and he indicated that there was no way, no how he was getting on that boat. He freaked out as we walked over the boat just to cross to the other side, leaving us to opt for a lesser water experience: the raft over to Mark Twain island. 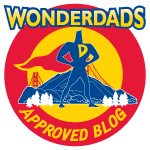 I hope we’ll be back to Pirates soon, but Li’l D will be the lead on that! Interesting that he suddenly wasn’t okay with it, but maybe because he’s actually thinking about it now. My parents have told me that when I was really young, I’d love rides like this, but then when I got older and thought about things like how we could fall out of the boat or “What if the pirates come alive?” and I’d not want anything to do with it. Bummer that he wasn’t up for it, but I’m sure he’ll be ready again eventually. We took our twin boys on it at 18 months. One fell asleep every time we rode it (it’s our favorite too) the other loved it. We’re going again in December, I’m hoping at 3 and 3/4 they remain cool with it. what I love in this story is the should-we-wake-them-should-they-stay-asleep-will-they-like-it-what-if-they-don’t discussion. When I think back to those endless, frequently whispered conversations w/my husband, I’m amazed that we actually managed to ever get anywhere, ever. I think it’s fantastic that the twins made it through. Yay team twins. Haha, that little deliberation happens daily in our house. Yeah, the Twins really rocked it. Made me proud. I have three girls, two of them twins (age 7). Sometimes they all want Mom. Just remember to enjoy the freedom when that happens instead of being put off! Good call. It’s a nice little break from the perpetual clinging I’ve gotten so accustomed to. Yep, it’s a choice you make. You can’t be afraid of them being afraid all the time, or they’ll never experience anything new. Great story to hear/read! I have been taking my daughter on this one since she was 3 weeks old and the boys at about 3 months… She loves every bit of it but the boys don’t favor it much at all. They shiver and cringe the whole way through, but no meltdowns, thank goodness!! My parents took my older sister on that ride when she was almost 2. She, unlike your toddlers, freaked out and screamed for her grandmother during the whole ride. However, given the chance, I’d take my kids on the ride. Yeah, it’s definitely worth a shot. I think more than anything it was about us wanting to go on it and share the fun of it with the kids. If it doesn’t work out, fine, at least we provided the opportunity for them to like something awesome. The way you described your daughter waking up was priceless. And this line, “Did you see the bird? Where’s the bird?” made me laugh out loud! I can definitely relate to your mad search for something that wasn’t a corpse to share with your little ones. Okay, not the corpse part, but we haven’t taken our kids to Disney yet. Ha! That should be in the brochure. Thanks for the preview — it was hilarious. Thanks! I think all parents find themselves going into that mode in scary situations–the HOLYCRAPIGOTTAFINDADISTRACTIONRIGHTNOW mode. Like I say in the post, even though parts can be scary, it’s called the Happiest Place on Earth for a reason. We had a blast bringing them, and can’t wait to go back. I’m sure you’ll have a similar experience.